As the scorching sun is beating down mercilessly upon the earthlings, our compassionate Mother Earth is all set to help her children beat the heat with her nature basket brimming with abundant body cooling produce. Come summer and we see vendors with cartloads of numerous fruits, tender coconuts and ice apples everywhere. Tender coconut is a natural Oral Rehydration Solution which helps in replenishing and regulating the body fluids and salts which are lost due to profuse sweating. 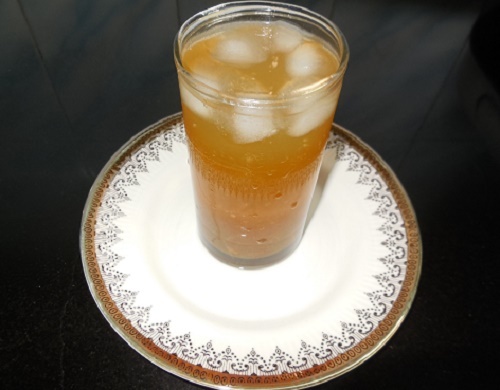 Panagam /Panaka is a traditional juice prepared using certain fruits and jaggery. The most common one being the lime and jaggery drink, Panagams/Panakas act as ORS and is prepared and distributed as Prasadam during all the festivals celebrated during summer. Pachadi and Panagam/Panaka prepared using a fruit called Vilambazham/Belada Hannu/ Wood Apple are ideal body coolants for the summer heat. This fruit has various health benefits apart from being an energy booster and a delicious body coolant. Elders recommend the fruit for rakta shuddi meaning detoxifying the blood. 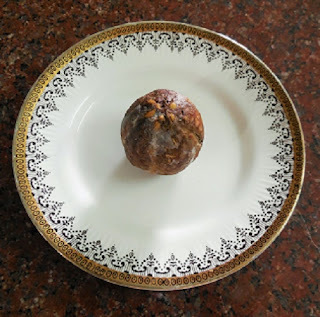 Vilambazham/ Belada hannu/ Wood apple has a woody outer shell and the pulpy fruit rattles inside the shell when ripe.The unique flavour the fruit emanates confirms its ripeness. 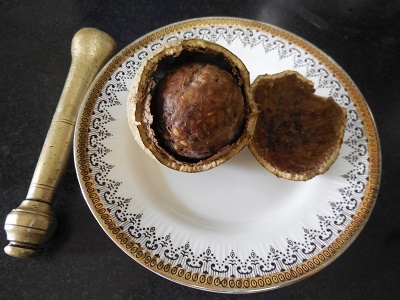 Hold the ripe fruit firmly in one hand and gently knock the shell using a pestle or the back of a knife to break open the shell in half. A perfectly ripe fruit will roll out like a ball from the broken shell. 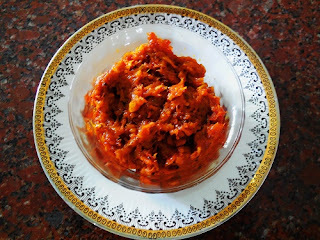 Vilambazha Pachadi / Belada Hannina Pachadi is a favourite finger licking relish prepared during traditional feasts. The botanical name of Vilambazham/Belada hannu is Limonia acidissima. The botanical name of Vilva pazham / Bilpatre hannu of the sacred bilva tree is Aegale marmelos/ Bael. The name Wood Apple is commonly used for both the fruits. Many a time the fruits are mistaken for each other. However the Vilvam/ Bilva/ Bael fruits are also edible. Now coming to Vilambazham /Belada Hannu recipes. 1. Mash the fruit using your hand with powdered jaggery and salt till the jaggery melts and blends well with the fruit. Using Mudde bella (soft round jaggery) is preferable as it is devoid of impurities. 2. Heat oil and splutter mustard seeds, and then add the broken red chillies. 3. Add the seasoning to the Vilambazha Pachadi / Belada Hannina Pachadi. 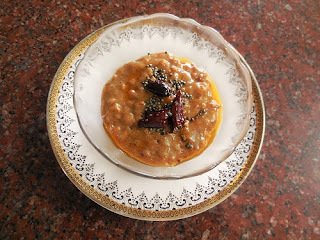 Enjoy the flavoursome sweet sour Pachadi along with its small crunchy seeds. 1. 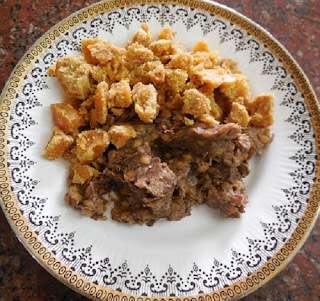 Blend the Wood Apple pulp, jaggery and salt together. 2. Add enough water to taste and filter the Panagam/Panaka. 3. Adjust the concentration of the drink according to taste. Enjoy the traditional Vilambazha Panagam/Belada Hannina Panaka to quench your thirst and stay healthy this summer. ( Jar )which was stacked away in the store room with other Ooruga jadis (Pickle Jars). She brought out only one cup of Tokku at a time to be used during our meals expecting it to last for the week.As a teenager I was so addicted to eating Tokku Sadam (Tokku mashed with steaming hot rice) at the beginning of every meal that the cup of Tokku did not last even for three days! 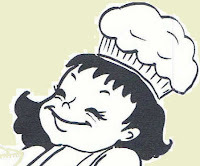 I wonder how I could devour that amount of spicy Manga Tokku without any side effects in those days! 1. Wash, peel and grate the raw mangoes and keep aside. 2. Dry roast the fenugreek seeds until it turns dark in colour emanating a very pleasant aroma. 3. Powder the roasted fenugreek seeds using a mortar and pestle. 5. When the mustard seeds splutter add asafoetida followed by the grated mangoes. 6. Add turmeric powder and salt. 7. Cook on medium flame stirring now and then till the oil separates. 8. Add the chilly powder which will absorb all the oil. 9. Keep stirring so that the Tokku does not get burnt till the oil once again separates. 10. Mix in the roasted and powdered fenugreek seeds. Cool the Tokku and store in a clean and dry glass jar. Enjoy the heavenly Manga Tokku with curd rice, adais and dosas. You can even use it as a bread spread. It is once again cooking time with my grand daughter D2. Since Ugadi coincides with her summer holidays we are having a great time experimenting with new dishes and D2 is happily clicking pictures of the end product. We decided to prepare an easy to make dessert for the Ugadi eve using Sago, Mango and Coconut milk. It turned out to be a flavoursome, pleasant looking luscious delight! 1. Dry roast the sago pearls till they pop in a heavy bottomed pan on low flame. 2. 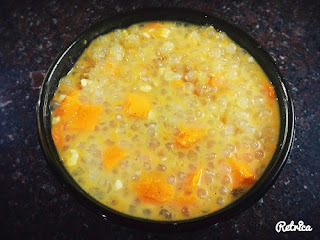 Wash the roasted sago two or three times. 3. Drain well, cover with a lid and allow it to soften for an hour. 4. Add 4 cups of water to the drained sago and cook till each pearl becomes transparent. 5. Add sugar and cook till the sugar dissolves and blends with the sago. 6. Switch off flame and allow the sago and sugar mixture to cool down. 7. 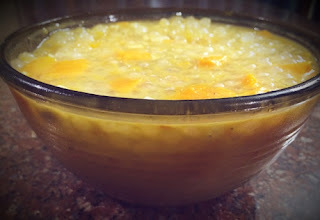 Add the mango pulp followed by the coconut milk to the cooled mixture and mix till they blend well. 8. Mix in the cardamom powder, raisins and cashew nuts. 9. Finally add the chopped mango pieces and gently mix with the pudding. 10. Chill till it sets. 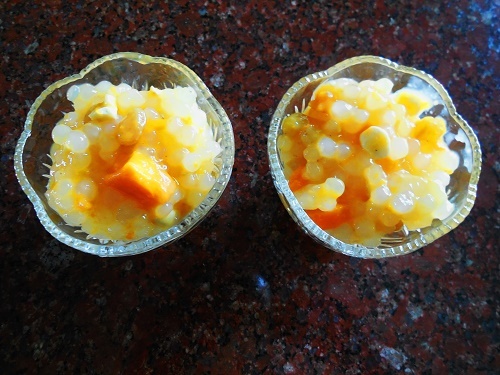 Enjoy the cool Sago and Mango Delight to your heart's content! A short recipe and a cascade of nostalgia! The intense heat of the sun kindled a burning desire in me to make the long forgotten Kuzhambu Vadams. I remember my childhood days when our home turned into a Vadam Vattal (Sun dried crispies and vegetables) factory at the onset of summer. 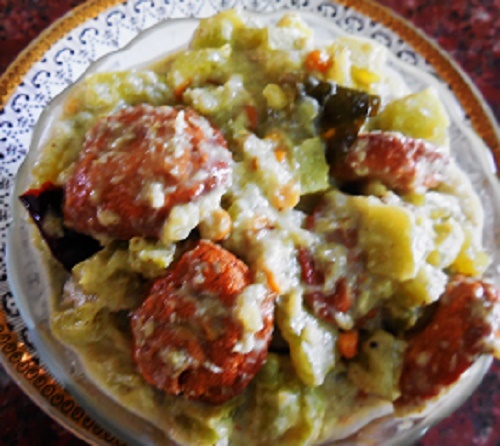 The kitchen was filled with the pungent smell of freshly ground green chilly paste which would go into the koozh - the gruel or batter to make vadams. The koozh was cooked in huge brass vessels the previous day. The next dawn saw my grand mother and her assistants clamouring around collecting old dothis, an umbrella, a cane and other paraphernalia to make huge quantities of Vadams to last for an year! A wooden cot was also shifted to the courtyard! I can hear some one shouting out 'I thought this was about Vadams!'. Yes I am coming to that! You will soon know what an important role the cot had to play in Vadam making! The old white dothi was spread out on the cot. The huge vessel containing the cooled 'koozh' was brought out by the helpers. Grandmother sat on a short stool beside the cot with an attendant holding the umbrella over her head. She efficiently poured out the 'koozh' using a small ladle in small circles at regular intervals on the dothi which was spread out on the cot. Now and again grand mother lifted herself up in a half standing (or should I say half sitting?) position. The attendant shifted the small stool to a more convenient position, and gently guided grandmother once again on to her seat so that she could continue with her Vadam making. The Vadam batter would get over precisely at the same time when grandmother meticulously completed one circumambulation around the cot. We - the children - took turns as in a relay game to shoo away the crows and squirrels with a proud wave of the cane, like a performing magician! Once my grand father executed his innovative idea and fixed four posts on to the four corners of the cot and hung a mosquito net over it to protect the Jevvarisi Vadams (Sago Crispies) from the avian onslaught! But grandmother was never sure of the rodents, and hence we were allowed to play "Magician" and hover around the cot waving our magic wands through out the day. The ants were kept away by placing four water filled cups under the four legs of the cot. It was also our duty to fill up the cups as and when the water evaporated due to the extreme heat of the sun. 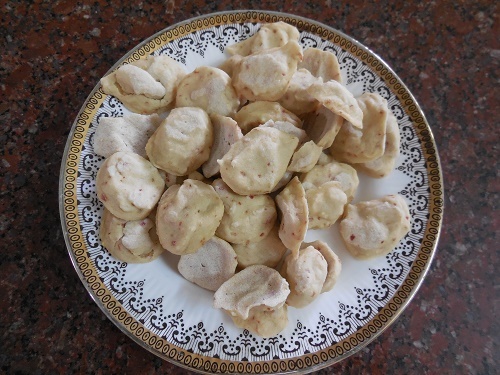 The other type of Vadam was the Nool Vadam or Peni Vadam which more or less looked like curled up noodles.This was prepared using cooked rice flour and pressed through a brass Hand Press called Nazhi. The Jevvarisi Vadams ( Sago crispies), Peni Vadams (Rice crispies), Pori Vadams (Puffed Rice crispies) and Kuzhambu Vadams ( Lentil crispies) enjoyed the blazing hot Sun bath under the mosquito net canopy for three or four days till they became bone dry. The sun dried Vadams were pealed out of the dothi and stored in huge boxes which in turn were stacked off in the store room. 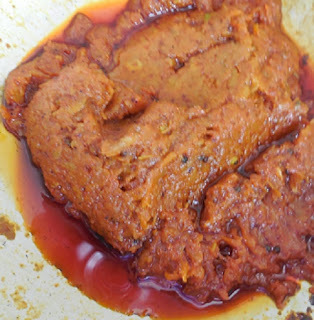 Kuzhambu Vadam is prepared by grinding lentils with spice. 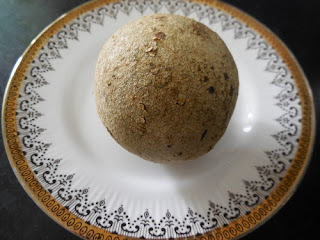 The dried vadams taste delicious when fried and dunked in Puli Kuzhambu or Koottu. 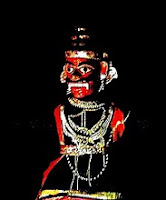 Kuzhambu Vadam plays a vital role in 'Naal kolam' which is a celebration held at the girl's home prior to her marriage.The girl is decked up in all her finery on an auspicious day and made to sit on a wooden plank. The women of the family adorn her with colourful glass bangles, flowers, sandal paste and vermilion. The girl places small scoops of the Kuzhambu Vadam batter on a large tray placed in front of her, indicating the beginning of the wedding preparations. In olden days all the Papads, Vadams and Pickles for a wedding were prepared at home in advance. It is believed that when the bride to be inaugurates the preparations with all her heart, her prayers and good will would ensure a smooth and happy wedding. My Naal Kolam was the beginning and end of my Vadam making stint! I usually got my stock of Vadams from my mother's place prepared by our dear Chef - in - need Meenakshi Mami for a long time. Now that we have cut short on eating fried stuff, I buy Vadams at the near by departmental stores for parties or feasts. With the sweltering heat this year, my mind was steeped in my Vadam nostalgia ! 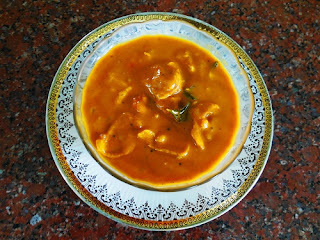 Hence I prepared Kuzhambu Vadams especially for this post! 1. Wash and soak black gram dal for two hours till the dal becomes soft. 2. Drain the dal and grind with all the other ingredients into a thick batter with out adding water. 3. Spread a big cloth on a wide tray. 4. Pinch small marble size balls from the ground batter and place them in rows at regular intervals on the cloth. 5. Sun dry the Vadams by placing the tray in a clean place devoid of dust. I covered the tray using another cloth to avoid dust. Though wet vadams stuck to the cloth on the first day, they could easily be peeled out after three days of sun drying without any damage. 6.Store the Vadams in a dry and air tight container. 1. Heat sesame oil in a kadai and add mustard seeds. 2. When the mustard splutters add fenugreek seeds and Bengalgram dal. 3. When the dal turns golden brown in colour add the broken red chillies and fry till crisp. 4. Add asafoetida, followed by curry leaves, slit green chilly, ginger and onion. 5. When the onion turns pink in colour add the sambar powder,turmeric powder, and rice flour. 6. Stir the spice powders once and immediately add the tamarind extract and salt. 7. Cook until the kuzhambu thickens emanating a very pleasant aroma and switch off flame. 8. 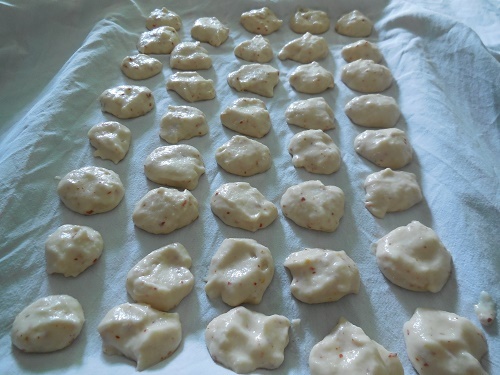 Deep fry the Kuzhambu Vadams till they turn golden brown in colour and dunk them in the Puli Kuzhambu. Enjoy the Vadam Puli Kuzhambu with steaming hot rice. 1. Cook chopped snake gourd, adding asafoetida and curry leaves till the vegetable is done. 2. Grind together coconut gratings, green chillies, cumin seeds and rice flour into a smooth paste. 3. Blend the ground paste and salt into the cooked vegetable. 4. Cook till the koottu thickens. 5. Heat sesame oil and splutter mustard seeds. 6. Add Bengal gram dal and fry till it turns golden brown in colour. 7. Add the broken red chillies and pour the seasoning into the koottu when the chillies become crisp. 8. Deep fry the Kuzhambu Vadams in hot oil till golden brown in colour , drain and dunk them in the koottu. Relish the Podalangai Vadam Koottu with hot rice. It is a good side dish for Chapaties and Poories as well.